should be in every man's wardrobe. Shoes are the foundation of every man’s wardrobe. 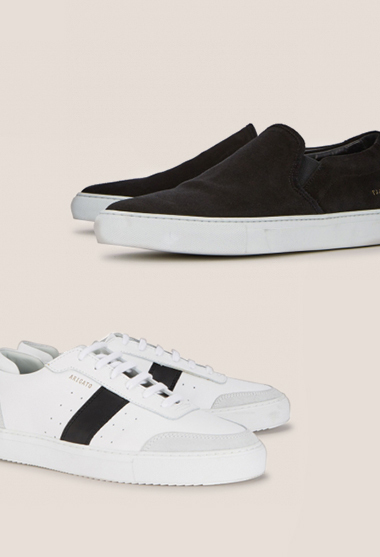 Whether you track down the latest cult items or stick to an array of basics with your everyday dressing, you could still be missing some essential types of shoes in your footwear arsenal. Why just have that one pair of smart shoes and one pair of trainers? Options are never a bad thing. If you buy into the fashion zeitgeist or not, let us take you through the fundamental styles, outlining their distinctive characteristics and decoding when they should be worn and how. 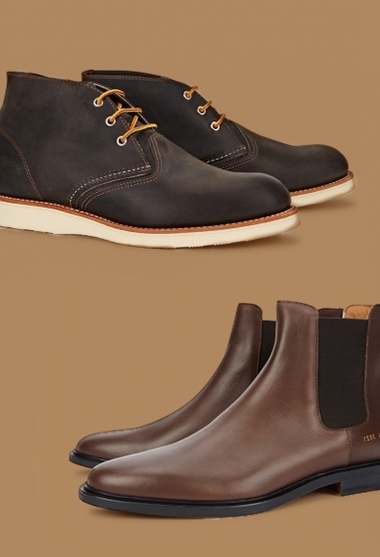 This is your one-stop shop guide to all things footwear, so pay attention. You’ll thank us afterwards. The Oxford was once the shoe a man would buy himself for his first job, back in the bygone days of yore before smart casual dress became a thing at work. Most versatile in black leather, the Oxford is the perennial shape to serve formal dress codes from weddings to black-tie events. Whatever the occasion, Oxfords are a certified fail-safe for all those last minute engagements. It’s a no-brainer. Derbies and Oxfords are often confused with each other, but the Derby shoe teeters between formal and smart-casual. It’s the ideal shoe to dress up a pair of jeans. Think of it as the cool nephew to its more formal counterpart. Characterised by the laces being sewn on top of the vamp (called ‘open lacing’, which adds more space), derbies add a touch of rebellion when paired suiting for all aspiring style mavericks. Falling somewhere between the Oxford and the Derby – in terms of formality – is the monk strap. Rather than laces, this style sports a buckle and strap closure and can be either single (one buckle) or double (two buckles, obviously). 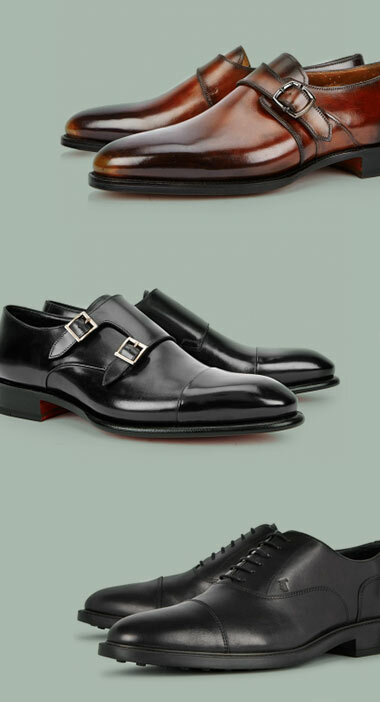 Of the three, Monk straps stand out as the more sartorially-daring choice, but with a massive pay-off. Perfect for the office or for a date, they are found most commonly in black or brown leather. If you’re looking to turn up the heat, go full throttle with a pair in smooth oxblood leather or tonal suede. First worn – and made famous – by the mods and The Beatles in the sixties, Chelsea boots are essential if you’re looking to master the art of smart casual dressing. Distinctive characteristics include close ankle fit and elastic side panel, so make the most of yours with slim jeans or trousers, which you can cuff and team with thick socks in the colder months. Committed nonconformists should wear Chelsea boots with suiting on semi-formal occasions, but make sure the trousers are cropped enough to reveal most of the boot. Extra style points for trousers with a turn-up. Taking their name from the game of polo, chukka boots are a low-ankle boot, usually crafted from three pieces of suede leather. If you see yourself going down Casual Avenue, pick a pair in brown or navy – ideal for teaming up with medium and dark shades of indigo denim. Those of you more inclined towards the smarter route, then black, naturally. If you’re struggling for style inspo on how to wear chukka boots, pair yours with rolled-up chinos or jeans, and a light Oxford shirt. For an even more casual style, try a desert boot; this is a type of chukka characterised by a crepe rubber sole that lends itself to off-duty dressing. An unmistakeable shoe style, brogues hail from north of the English border (by which we mean Scotland) and are distinctive due to their punched and stitched surface. The punctures were originally designed to allow water to drain from the shoe as they were meant for the great outdoors; they also (more importantly) have the power to give a rustic dapperness to any outfit, even if the wearer is a die-hard city-slicker. Brogues work as an office shoe in a smooth or pebble grain leather or as a go-to summer shoe if you opt for a pair with contrast panels or coloured suede. Much loved for its convenient slip-on, slip-off design, the loafer stands as a defining hallmark of the iconic prep aesthetic. With the advent of its descendant styles such as penny and tassel loafer, this long-standing shoe now serves multiple style tribes from the fashion follower to the conventional dresser. Perfect for summer, loafers can be paired with suits that have a slightly-cropped trouser length or with rolled-up jeans or chinos. Pick your socks in a complimentary colour for additional style kudos. 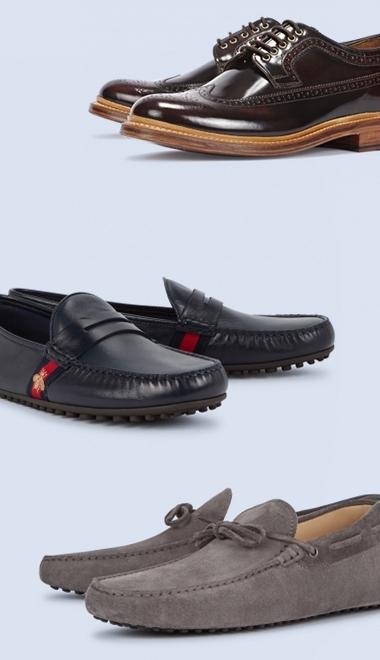 If you want even more easy-going, let us introduce you to the moccasin. Another style with the slip-on design, you might also know them as driving shoes, but this is a specific type of if they feature rubber-grommet soles. Moccasins aren’t intended for long walks or nightclub jaunts, but are champs of coffee date casual and impromptu lunches. There’s no going wrong with a navy or black hero pair, or go against the grain with a rich-coloured suede. For a long while, brightly-coloured trainers with brazen branding dominated the men’s trainer scene. Now, minimal designs are giving their bold counterpart a run for their money. Think one solid colourway, subtle branding and usually low-top. If you’re starting your sneaker collection from scratch or just having a complete footwear overhaul, begin with a leather pair in white. It’s a timeless and effortless style with massive merit that you can wear on almost any occasion. Just keep ‘em clean. Blending the comfort of a trainer with the sleekness of a loafer, the skate shoe is another no-brainer. Casual yet edgy, this shape channels quintessential Californian skateboarder vibes even if you’re not jumping off the half-pipe. If you’re lucky enough to have a lax office dress code or just want to break away from the 9 to 5 humdrum, this is the shoe that will do the trick.